Hello, everyone! 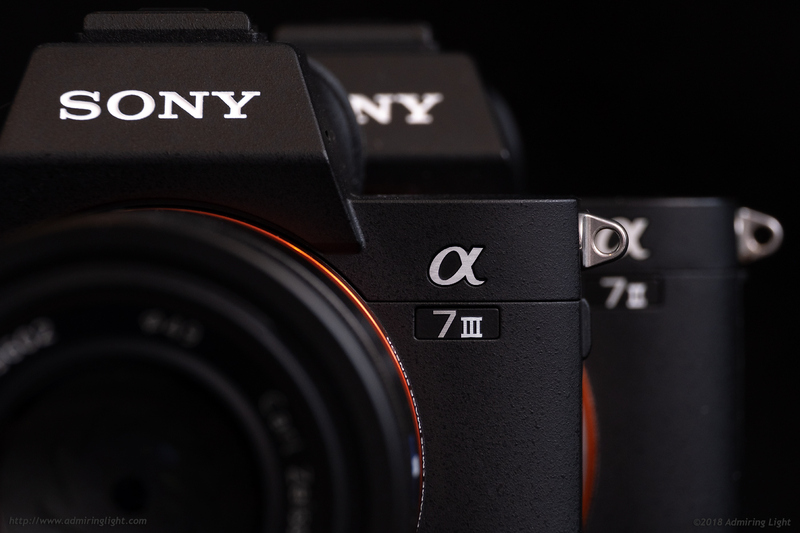 The web is buzzing with all the reviews and news of Sony’s new powerhouse for a bargain price, the A7 III. The new A7 III put a huge number of upgrades into the ‘basic’ model of full-frame mirrorless camera, including vastly improved autofocus, dual card slots, a bunch of new features and a brand new backside illuminated sensor. I’ve got an A7 III in my possession, and while a full review will be forthcoming in the next week or two, I thought I’d take a quick look at the new sensor with regards to high ISO performance. Improved high ISO is certainly not the only improvement with this sensor, and in my shooting with the camera so far, I have found the A7 III to have better shadow detail and more malleable files in general, but I have definitely noticed improved performance at higher ISOs, and wanted to see how it truly performed in comparison to the A7 II, the model it replaces in the Sony lineup. 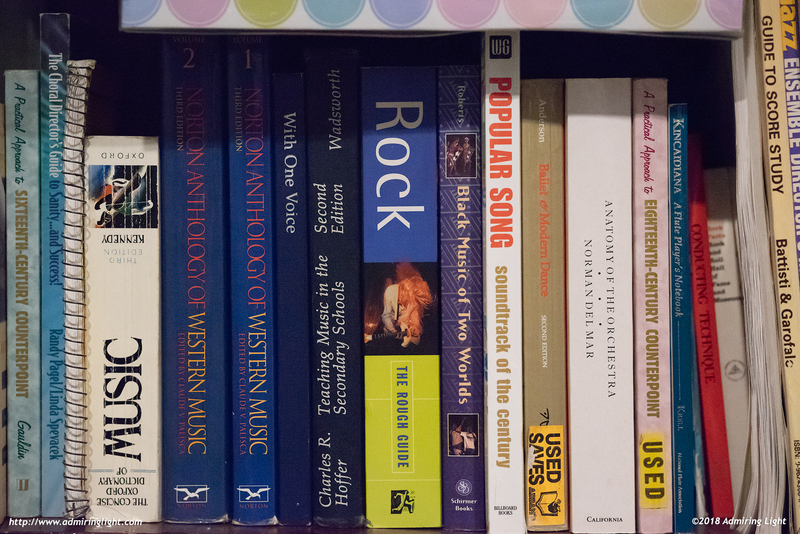 I placed each camera on a tripod in a room with relatively dim indoor lighting, utilized self time to avoid shake and focused on a bookshelf using the Sony FE 85mm f/1.8 lens at f/4. I then ran each camera through full stop ISOs from ISO 100 to the camera’s maximum. The A7 II tops out at ISO 25,600, but I wanted to see how far it could go, so I continued to take shots with the A7 II, underexposing by 1, 2, and 3 stops and bringing the files up in Lightroom by the same amount, to deliver equivalent exposures for ISOs 51,200 through 204,800. Sharpening, white balance, etc, were all matched in Lightroom to provide an even playing field. The cameras meter a bit differently, but each camera was shot at the same shutter speed for each ISO, providing equivalent exposure. As noise in the bright areas is often harder to discern, I took the image crops from an area in the darker part of the image near the top of the frame, that also showed a fair bit of detail. 100% crops from ISO 100 through ISO 1600 are below. Click on the image to open it full size in a new tab, and make sure you zoom to full size to properly evaluate the results. As you can see, at lower ISOs, the difference between the two cameras is quite slight. Aside from a very slight misfocus at ISO 400, you can see that the A7 III photos are just a touch sharper, likely due to a weaker anti-aliasing filter. You can even see part of the subtle diagonal dithered pattern in the leftmost book, a detail that is nearly invisible to the naked eye, but I confirmed with macro shots as being actually part of the book printing. At ISO 800 and 1600, the A7 III has a slight edge, with smoother gradients, a bit more detail and slightly lower noise. Those smoother gradients will allow for greater postprocessing flexibility, and also help indicate the differences when expanding shadow detail in images shot at lower ISO. At these higher ISOs, the A7 III takes a clear lead, with visibly lower noise at ISO 3200 and 6400, and dramatically lower noise at the higher ISOs. While pure grain appears to be about 2/3 stop better on the A7 III, the detail levels and color fidelity exhibit resilience higher than that. At ISO 12,800, the A7 II is beginning to get washed out, with lowered saturation and a heavy loss of detail. The A7 III still has a fair bit of noise, perhaps a bit more than the A7 II at 6400, but it maintains detail and color far better than the A7 II. At these ISOs, overall, I’d say the A7 III is around a stop better than its predecessor, with differences becoming more dramatic the higher the ISO becomes. At the top end of the A7 III range, you can see that the expanded ISOs of 102,400 and 204,800 are really very noisy, and are only going to be used in very extreme circumstances where no other shot is available. ISO 102,400 still has some detail left, but color saturation has gone downhill. At the top ISO of 204,800, there’s very little color information left, and almost no detail. I definitely don’t view 102,400 as usable for anything other than emergency shots, and 204,800 is really just there as a spec sheet item. On the positive side, Sony’s done a remarkable job to eliminate any color shift in the files at these crazy high ISOs, something the A7 II does as early as ISO 25,600. I’d discuss the A7 II crops here, but I think they speak for themselves. They are complete garbage. 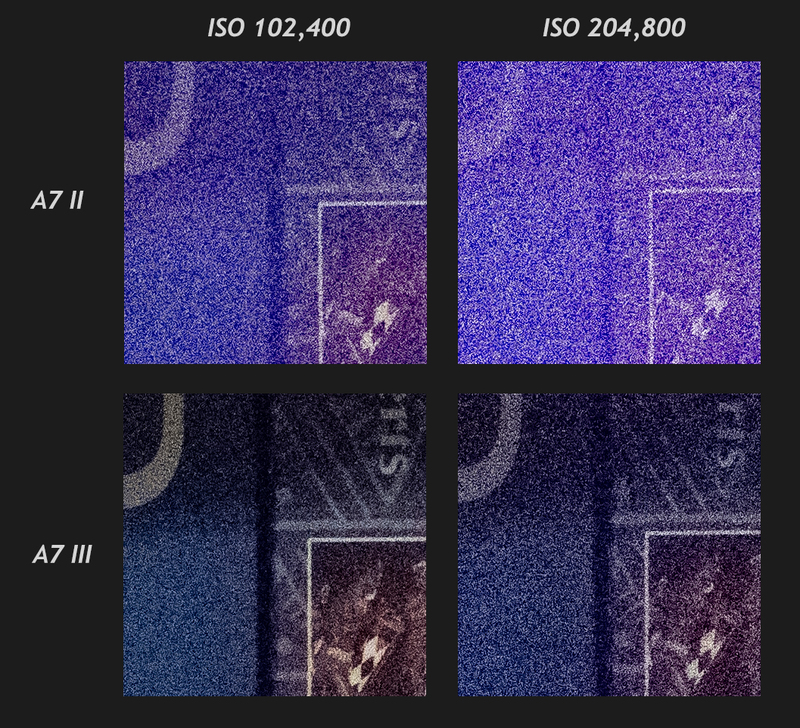 For the A7 II, while noise levels could possibly be usable at ISO 25,600, when using noise reduction and reducing for the web, the color shift is way too prominent and the saturation way too out of whack. So, ISO 12,800 it is. There is still a slight blue shift at this ISO, but it’s not too bad. For the A7 III, color shift isn’t an issue at any ISO, and saturation doesn’t really become an issue until 102,400, so ISO 51,200 is what I consider usable for small prints and web use on this camera. 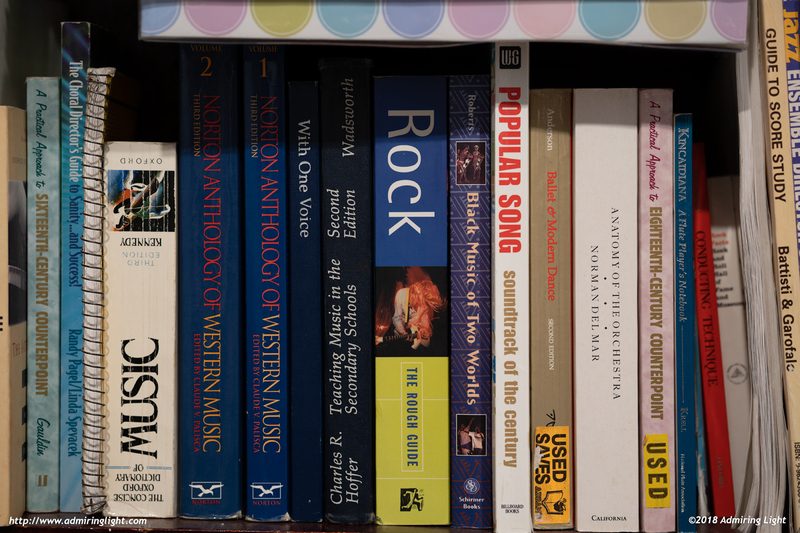 See below for the resulting images with noise reduction applied to taste and then my normal web reduction. The A7 III is a very interesting camera release from Sony, and a solid upgrade from the A7 II in many ways, which I will go into depth in my review. One of those upgrades is low-light sensor performance, and it definitely plays out in this test. The A7 III is a bit better at medium ISOs, and around 2/3 of a stop to 1 stop better at higher ISOs, with the lead expanding as you get into extreme settings. This isn’t a revolutionary change, but given the high quality of the A7 II, it’s a very nice upgrade, and makes the A7 III a better camera for lower light shooting. Be sure to come back for my full in-depth review of the A7 III in the next week or two! Hi, thanks for the article. I have also received my A7 III recently and I’m experiencing a weird cracking noise coming from inside the body around NFC chip area when used with heavy lenses (I’m using Sigma 24-35mm F2 and Sigma 100-400mm F5-6.3 with MC11 adapter). Could you please confirm if your sample does the same or it’s just me and my unit needs to be replaced. Thank you. I can’t say that I have experienced what you are describing. Hi Jordan, is it still worth to buy the A7ii in 2018?